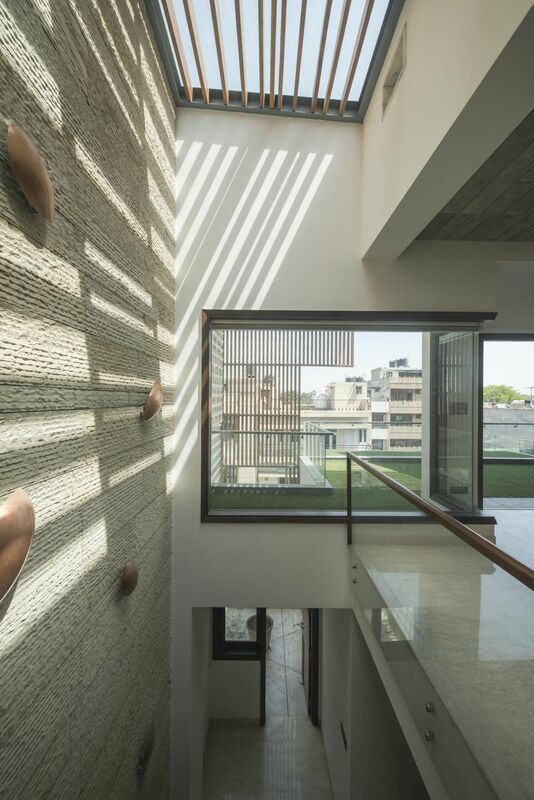 J House, New Delhi - by Spaces KA - Kapil Aggarwal - ArchitectureLive! 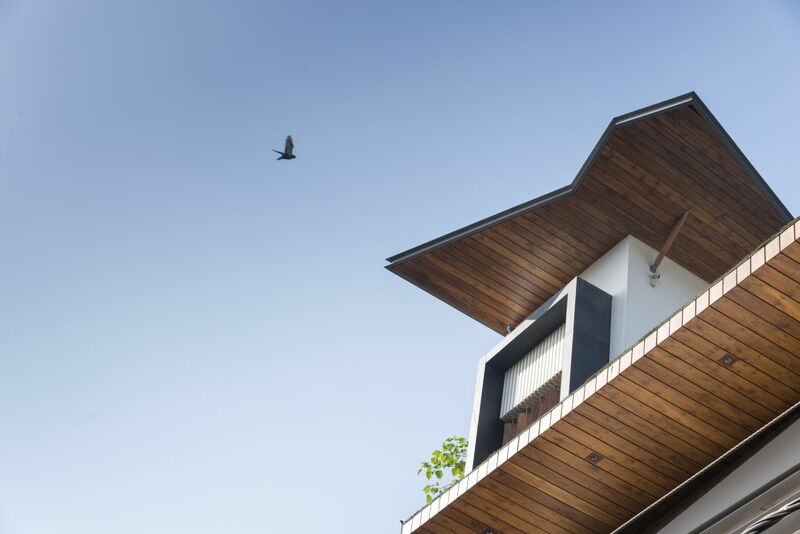 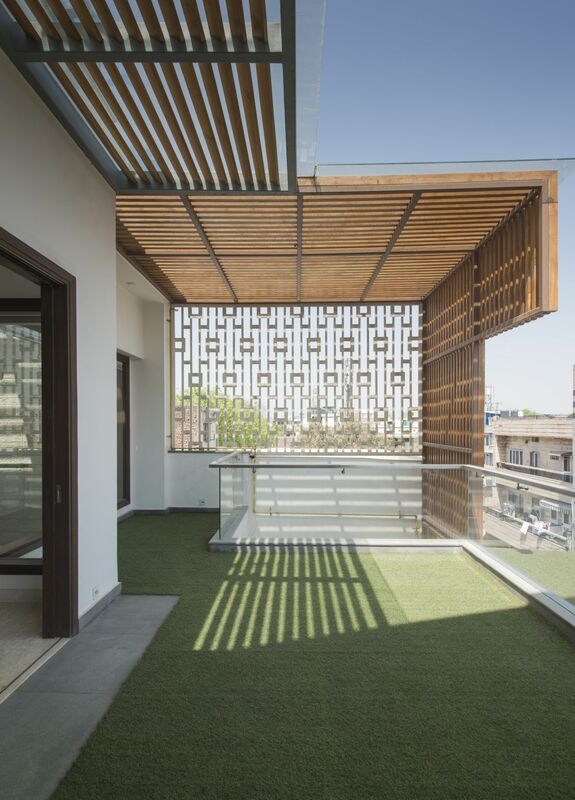 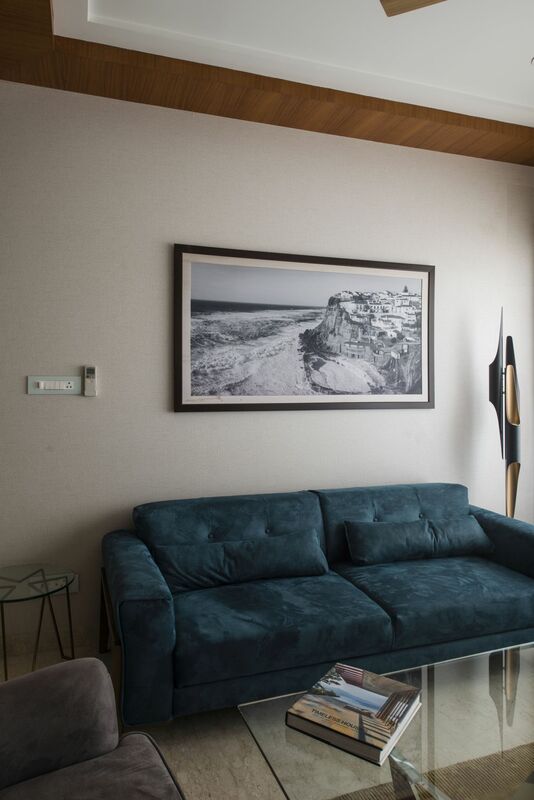 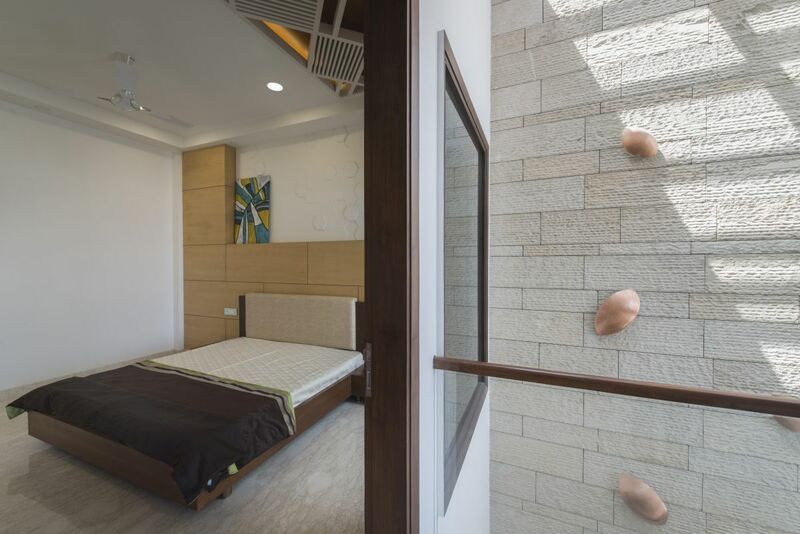 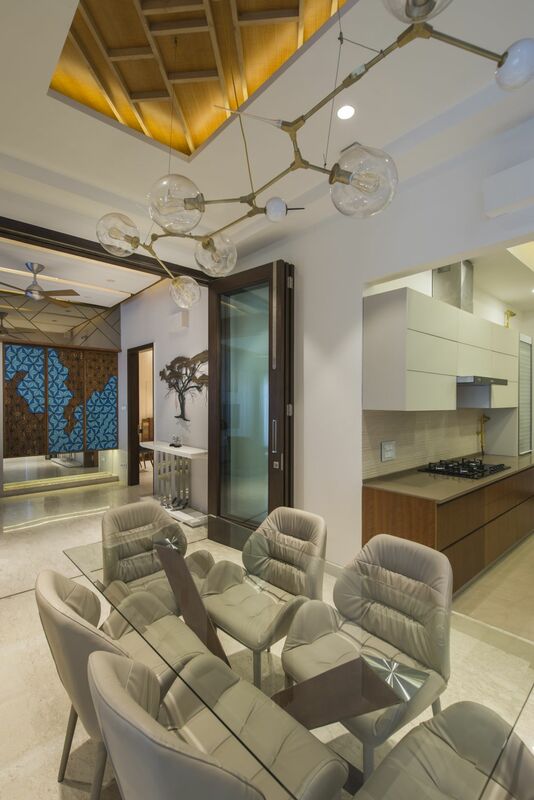 J House designed by Kapil Aggarwal is a weekend home, located in Delhi, with plot area of 1800 sq.ft. 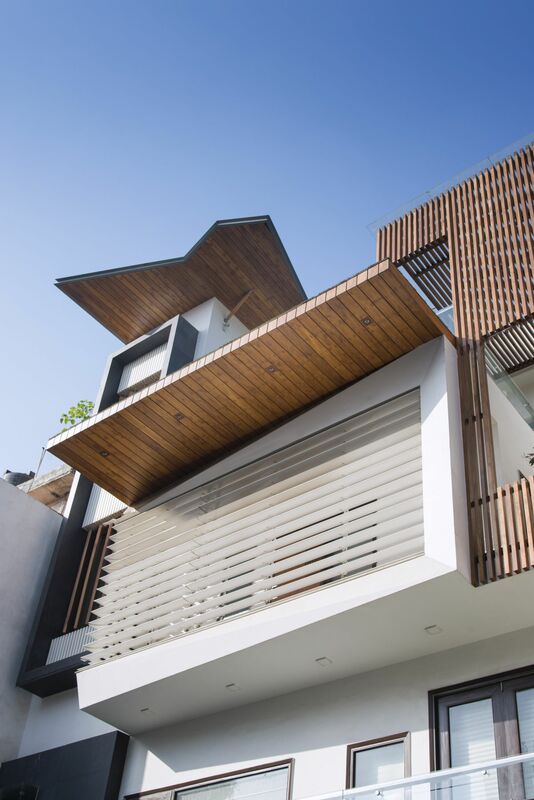 The house is designed in a contemporary style of architecture with a lot of open spaces to ensure visual connectivity between all the floors and allows an abundant inflow of natural light and air. 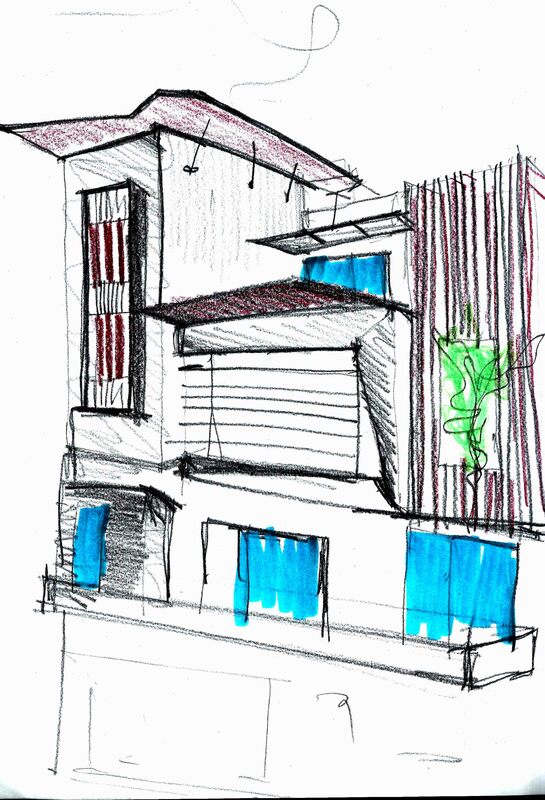 The designing has been done considering client’s brief who wanted a distinctive but a simple family abode. 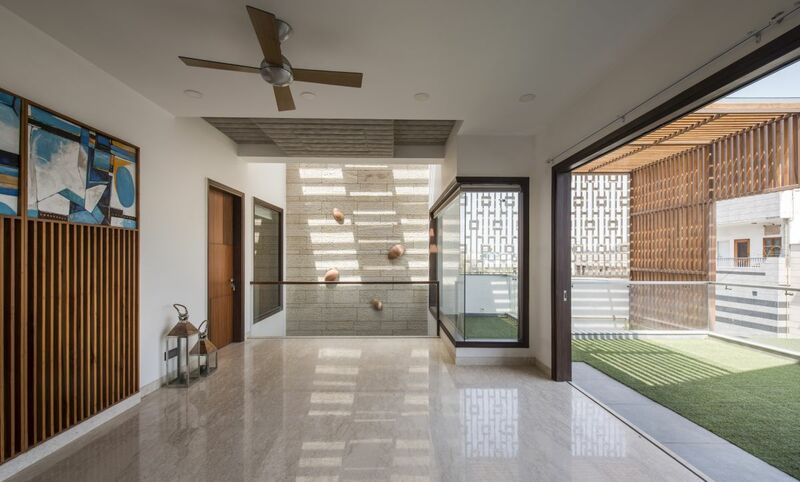 So we visualized the house as an expression of Indian modern and contemporary architecture with a minimal material palette. 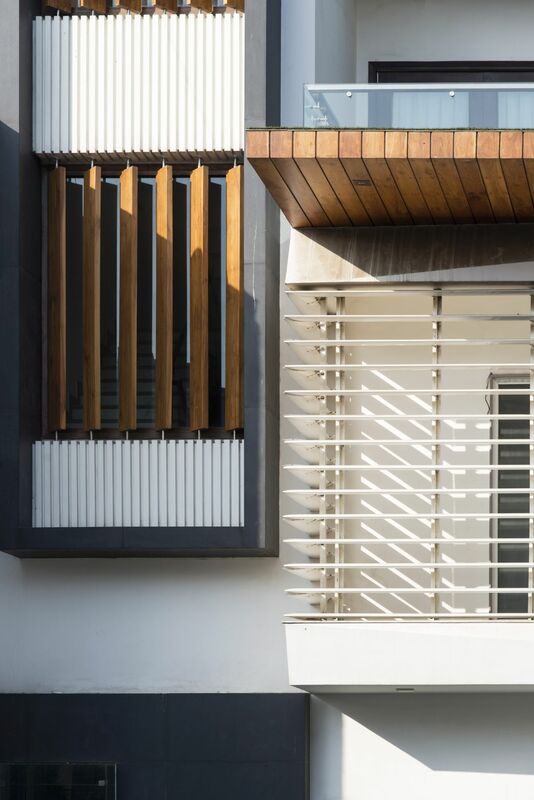 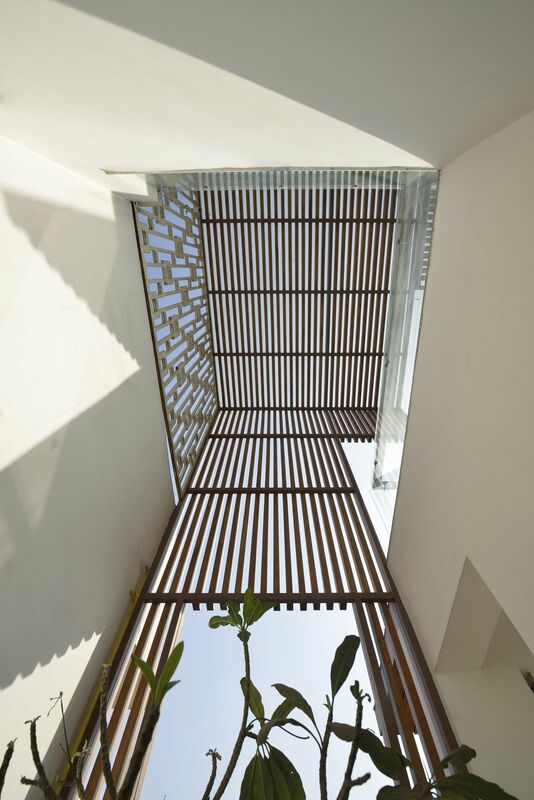 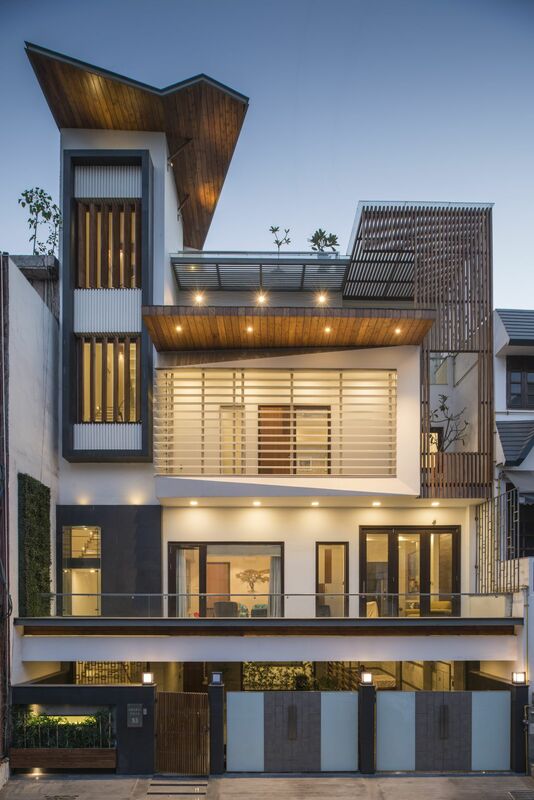 The residence is located in an urban context, having a strategically planned outward looking interior space with required privacy created by the usage of louvers and screens. 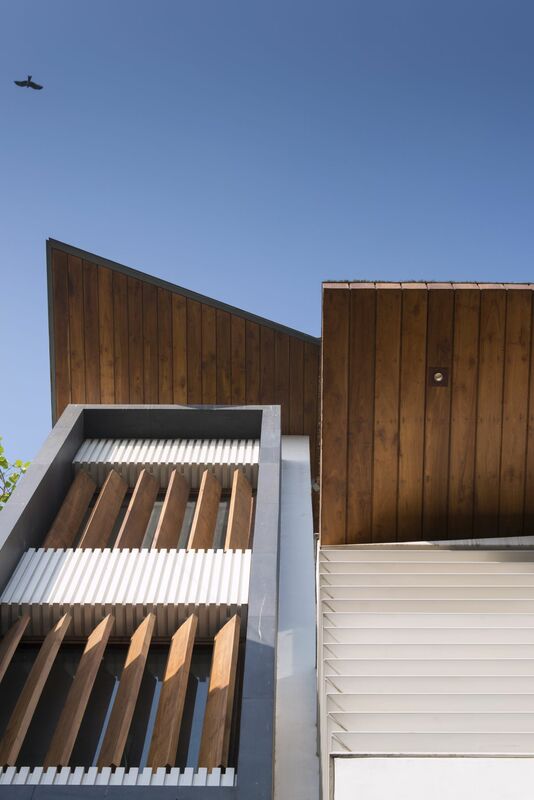 The house responds well with internal connectivity and provides interactive spaces for the family, and aimed towards allowing maximum daylight into the interior spaces. 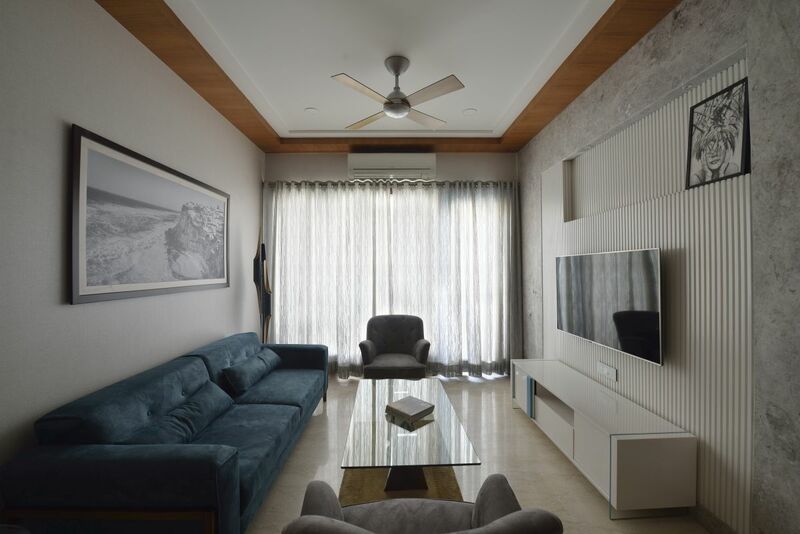 All the walls are majorly planned in monochrome and splashes of colors have been added with bright colors in artwork and furniture. 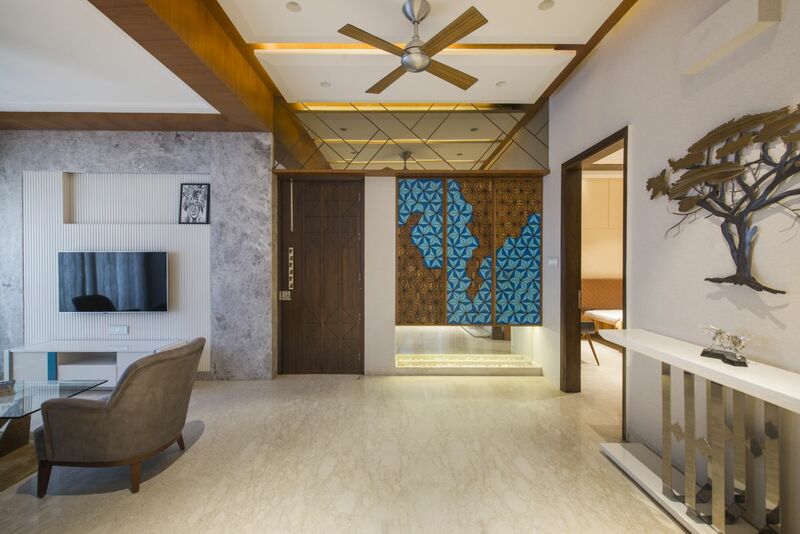 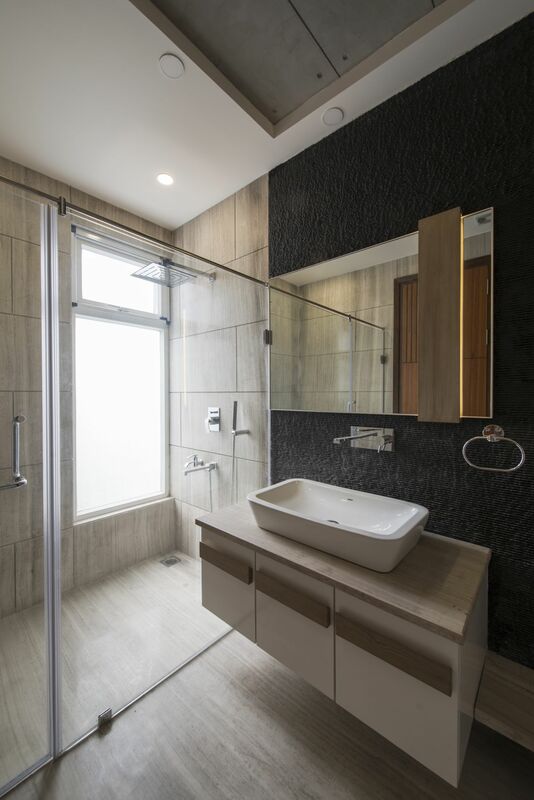 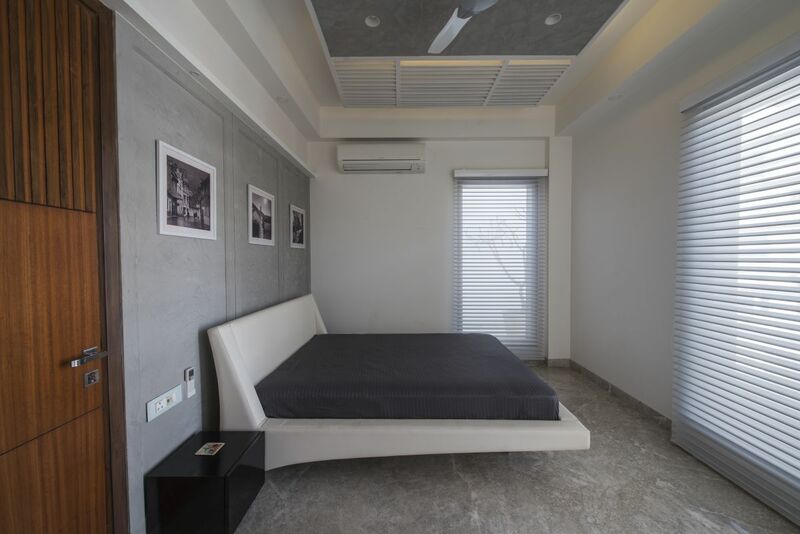 As per the client requirement, a bedroom, kitchen, study, drawing and dining are kept on ground floor, interconnected from within by triple height spaces allowing light to travel throughout the house. 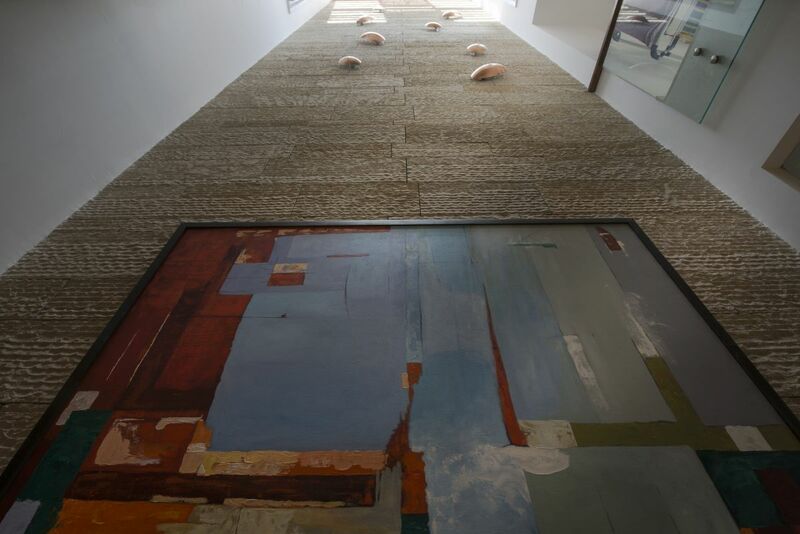 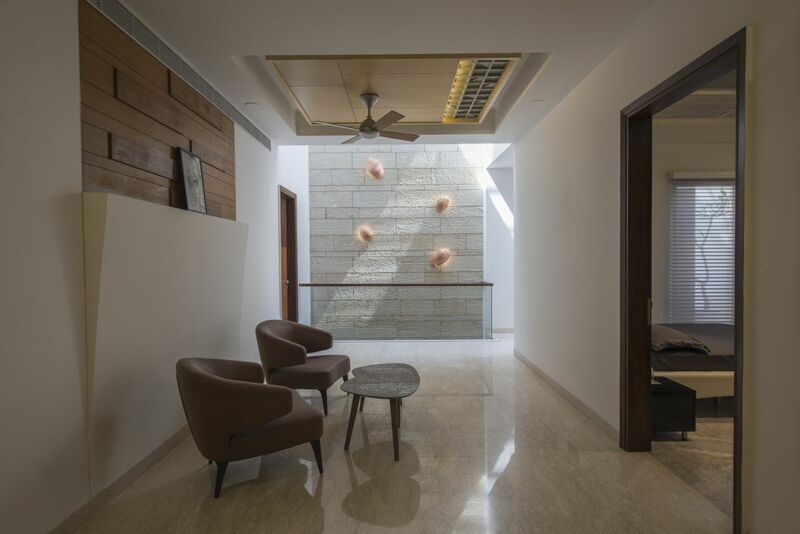 This triple height space is characterized with a rough Indian Gwalior stone, placed in different sizes adding a very subtle texture in the space. 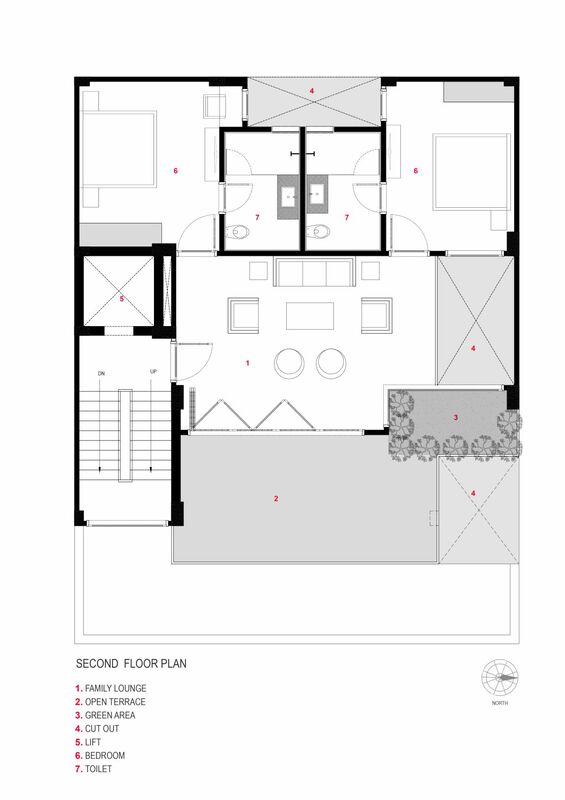 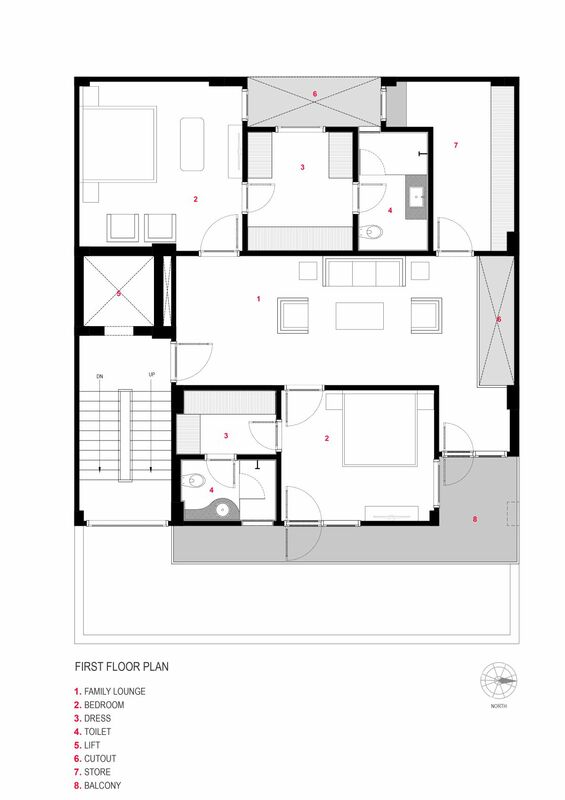 The first floor has 2 bedrooms, a family lounge and a small terrace in the front with a tree in the center. 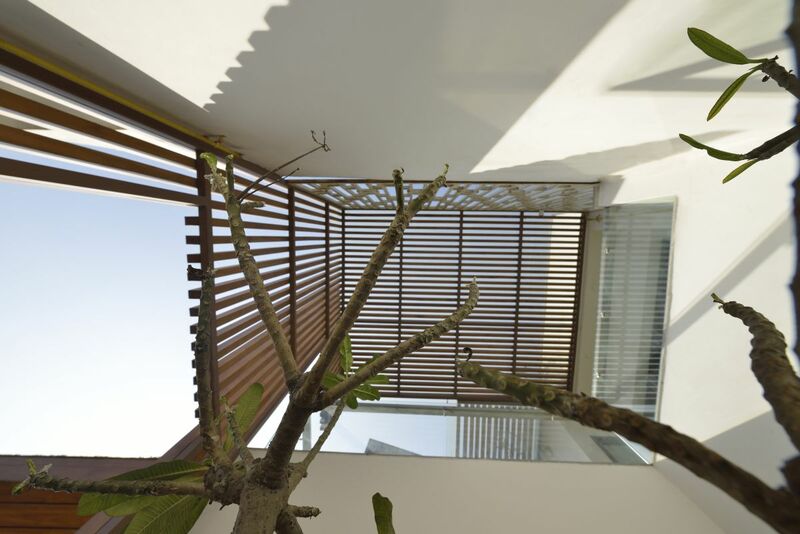 This terrace is a semi open space covered with wooden louvers scaling up to the second floor creating a double height volume. 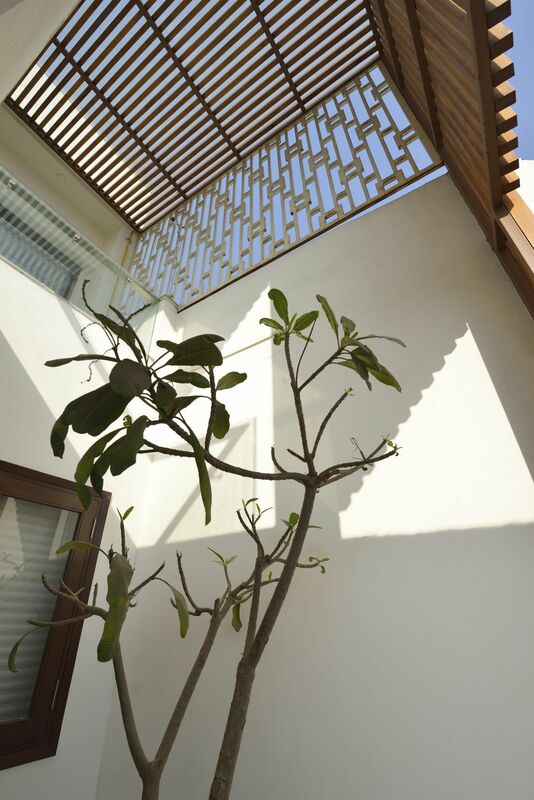 On the second floor the house opens up to a big terrace garden which experienced as an extended part of the lobby. 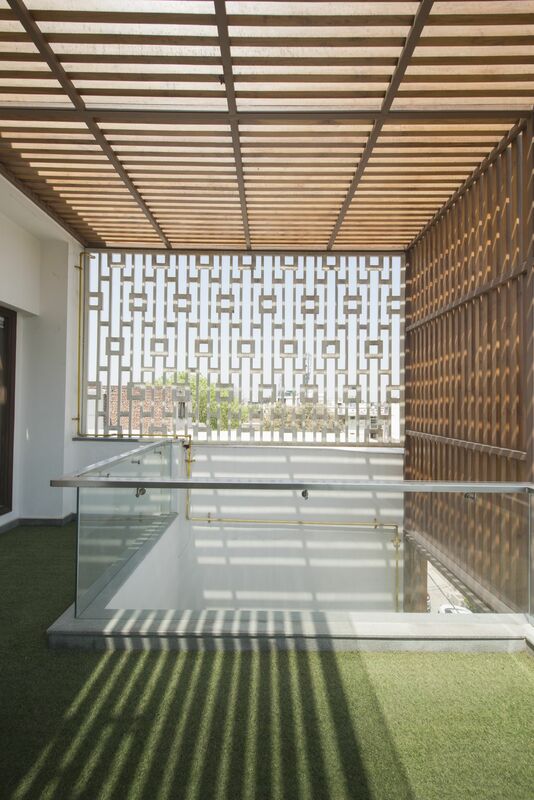 This terrace interacts well with a visually connectivity to the interiors and the terrace below. 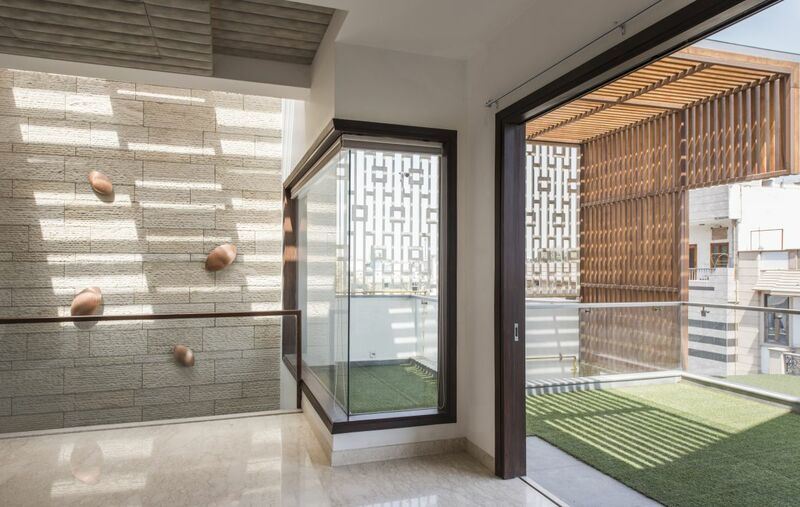 Usage of greenery both in the interiors as well as exteriors enhances the quality of living and also adds to the minimal palette used throughout. 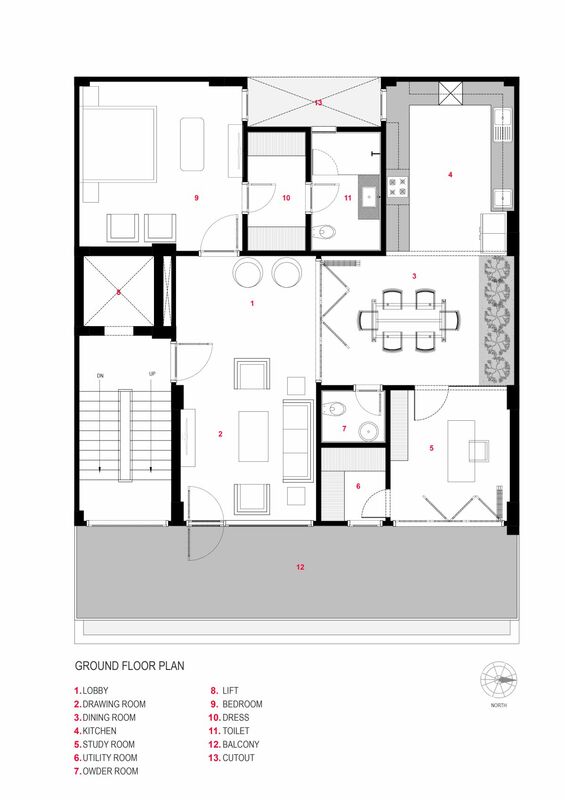 The elevation is purely driven from the functions of the interiors. 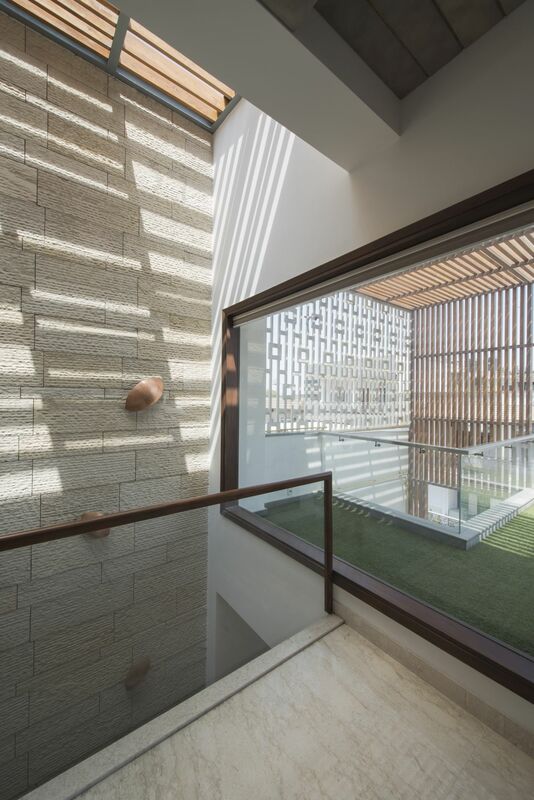 A few blocks have been carved out from the elevation to accommodate multiple terraces which in turn enhance the experience in the interiors. 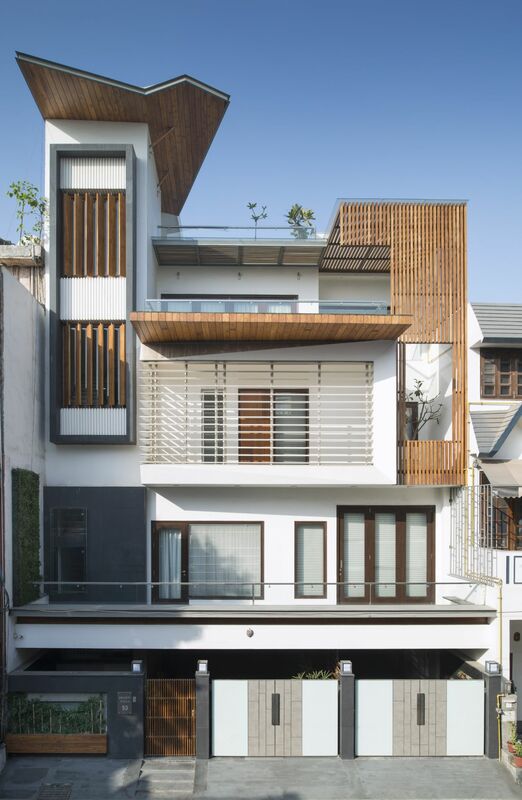 These terraces had to be covered up in a way to create cozy semi-private zones rather than having a direct sight from the street. 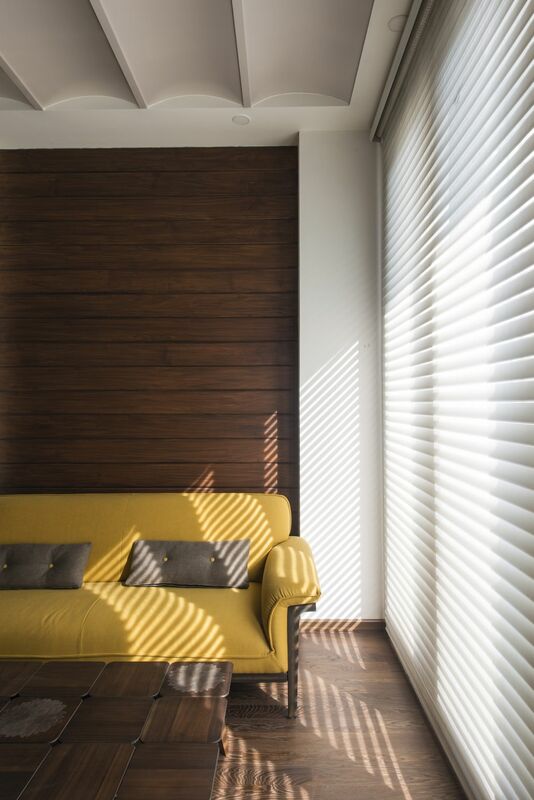 Wooden and metal elements are custom designed to both create the privacy needed and also create the play of light and shadows in the interiors. 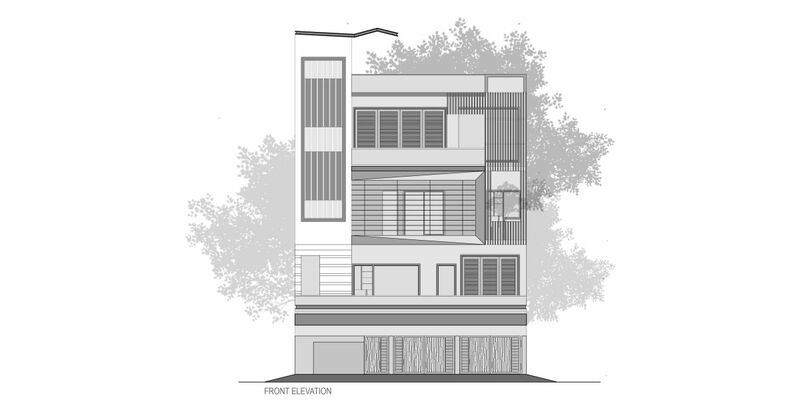 The major element in the left part of the elevation is a staircase which had to be treated well to make it a distinctive feature as well. 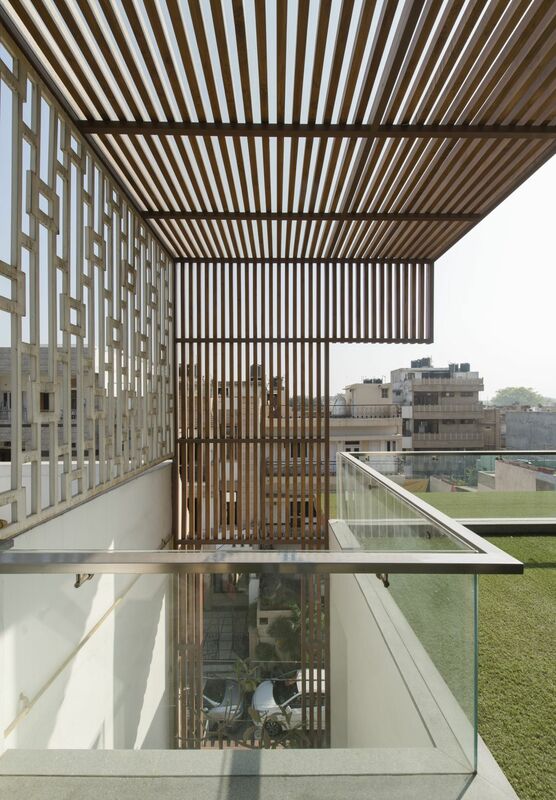 The front wall uses large glass panes shaded using wooden louvers and an abstract cantilevered roof element above it.